Is Perfect Bacon Bowl the next Snuggie? 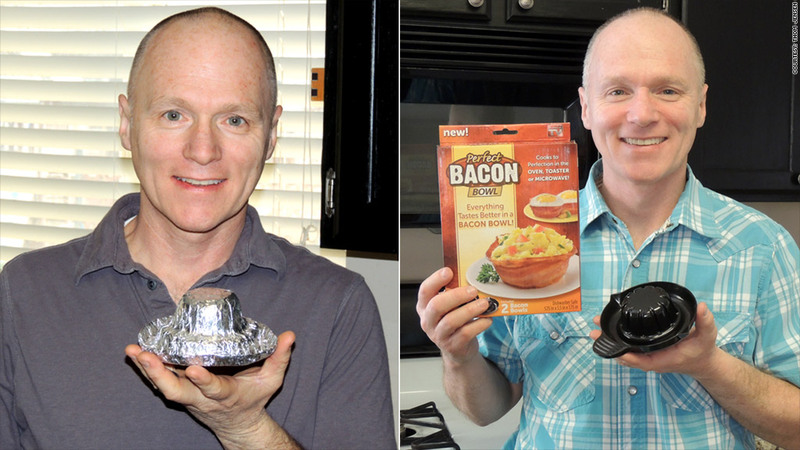 Thom Jensen holds the tinfoil prototype [left] of his Perfect Bacon Bowl, which has sold 2 million units since November. It's no secret that America loves its bacon. For proof, just look at the crazy success of the Perfect Bacon Bowl, As Seen on TV's newest sensation. The Perfect Bacon Bowl resembles an upside-down plastic bowl. Wrap three strips of bacon around it, pop it in the oven, microwave or toaster oven and the bacon cooks in the shape of the container -- a "bacon bowl." Then you fill it with whatever you want -- scrambled eggs, dip, mac 'n cheese. The Perfect Bacon Bowl debuted in November 2013 on As Seen on TV and almost immediately became a hit. Since then, more than two million boxes have been sold (they come two to a box and retail for $10.99). Thom Jensen wasn't looking to create the next big thing. He just wanted to shake up breakfast for his kids. "I was playing around trying to create a bacon turtle," he said of that fateful Saturday in early 2012. "I used an upside muffin pan but it wouldn't work." Jensen eventually created a crude bowl from tinfoil. It worked like a charm. He wrapped bacon strips around it, cooked it in the oven and out popped his very first bacon bowl. "It was a big hit with the kids," he said. Jensen is a research histologist in Salt Lake City and has always been a bit of an amateur inventor. Over the years, he has submitted 12 ideas -- including a curling iron and a motorbike blinker that turned off automatically -- to Edison Nation, a company that helps inventors develop, patent, license and market their inventions. None of those made the cut. But in July 2012, Jensen paid the $20 fee and submitted his idea for the bacon bowl online with Edison Nation's division that partners with As Seen on TV. This turned out to be his golden ticket. Related: Solar power lamps for off the grid communities. Edison Nation's As Seen on TV division receives over 5,000 submissions a year, but the bacon bowl immediately caught their attention, according to President Todd Stancombe. "The tinfoil prototype was a long way from a product that we would market," he said, but they still chose it as one of 24 products to put into development. Edison Nation spent a year (and between $100,000 to $200,000) developing and testing the product. In June 2013, the company felt confident about the Bacon Bowl and filmed its As Seen on TV commercial. Initially, the Bacon Bowls were manufactured in Mississippi. But production moved to China in December after demand spiked. It was picked up by Wal-Mart (WMT) and Target (TGT) in February, which supercharged sales even further. Scott Boilen, CEO of Allstar Products Group (an As Seen on TV company), said Bacon Bowl's rapid success is reminiscent of another As Seen on TV product that captured America's fancy. "The exceptional sales right out of the gate remind us of how Snuggie began," he said. The blanket with sleeves was ridiculed when it launched in 2008, but it's since sold 30 million units and spawned countless knock-offs. Boilen said the Bacon Bowl is generating similar social media buzz. "People seem to be obsessed with bacon, and they love taking pictures of their own Bacon Bowl creations," he said. Jensen is proud of Bacon Bowl's popularity but he hasn't quit his day job, yet. He's hoping his royalty agreement with Edison Nation -- which gives him 7.5% of adjusted gross revenue -- will allow him to do that. "I'll be getting a check once a year. When I see the first check in 2015, I hope I can retire," said Jensen. In the meantime, Jensen has another invention in the works. But he's not giving away any hints.